The evidence of the very worst collision that Earth experienced is not subtle at all. In fact, you have probably looked directly at it hundreds of times already, perhaps without realizing what it is. That collision was with a planet named Theia, which was approximately the size of Mars (Figure 22.11). Not long after Earth formed, Theia struck Earth. When Theia slammed into Earth, Theia’s metal core merged with Earth’s core, and debris from the outer silicate layers was cast into space, forming a ring of rubble around Earth. The material within the ring coalesced into a new body in orbit around Earth, giving us our moon. Remarkably, the debris may have coalesced in 10 years or fewer! 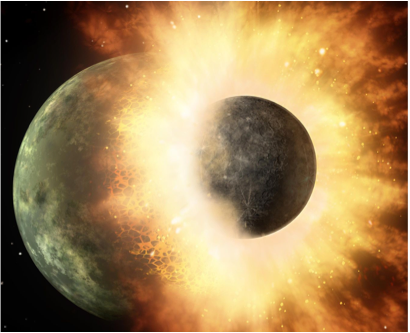 This scenario for the formation of the moon is called the giant impact hypothesis. Next: 22.5 Are There Other Earths? 22.4 Earth’s First 2 Billion Years by Karla Panchuk, Department of Geological Sciences, University of Saskatchewan is licensed under a Creative Commons Attribution 4.0 International License, except where otherwise noted.